When it comes to budgeting, most of us have a pretty general idea as to what that means. In fact you might have a simple budget where you set spending targets on certain categories, like groceries. When you’re over budget, well, you might remedy that by spending less next week (if you can get away with it). But where did that “over budget” money come from? Without a zero-based budget you’ll never know! Importantly, if you ignore those over budget expenditures, you’ll almost certainly end up with unexpected pinches in other categories, or even taking on unwanted credit card debt. What exactly is a zero-based budget? Simply put, a zero-based budget starts with your income. The idea is you have some number of dollars that come in via your income. You then prioritize how to spend those dollars until every last dollar has a role in the budget. In other words, every dollar is accounted for, until you have none left to budget, thus “zero-based”! When setting up a zero-based budget you’ll want to think about all of your various monthly expenses like rent or mortgage, utilities, cell phone, internet, groceries and on and on. Once you have your list of expenses, it is a good idea to think about them in terms of priority. For example, the expenses that cover your basic needs like shelter and food are probably more important than your entertainment or “fun money” categories. Once your prioritized list is complete you’ll start allocating money from income to those expenses, working your way down from highest priority to lowest. Try not to get too caught up with making the perfect list, prioritizing every expense is hard it’s a good idea to have only three priority levels: must haves, nice to haves and totally optional (or something along those lines). You’ll most likely run into some situation where you realize you can’t cover everything you want to. Welcome to a real budget! One of the nice things about this strategy is that if forces you to look at your spending. So don’t be surprised if you find yourself asking these types of questions: Do I really need to spend this much at the coffee shop every week? Are we eating out too much? By the end of this exercise, you’ll know exactly what you need to cover your monthly expenses. You’ll probably groan about it at first, less dining out, waiting for Netflix instead of going to the theater. But don’t worry, every successful budgeter has been there. Almost all unwanted debt is the result of spending income indiscriminately without any knowledge of what you can actually afford, or the result of getting hit with a big unexpected expense. The zero-based budget we’ve discussed so far let’s you answer the question of, “can I afford this and still have enough for my other upcoming bills?” But what about the unexpected medical bill, or mechanical failure with your car? How do you make sure those big unexpected expenses don’t send you into debt? Well, it’s all about having a rainy day fund. The biggest budget killer is the unanticipated BIG expense. I took my car in for inspection expecting a $30 charge. (In some states you can’t drive legally without having a valid inspection sticker on the windshield, which means getting your car inspected by a qualified mechanic.) Little did I know, my tires needed to be replaced to pass the inspection. Thirty dollars suddenly became $850. Ouch! That will blow a whole in any budget. Unless, of course, you have prepared by also funding a rainy day fund, or what some call an emergency fund. I know what you might be thinking, how can I put money into a rainy day fund if I’ve allocated all my income to cover my known expenses? You can’t! But do you see where this is going? We really only have two choices, we have funds we can draw on for emergencies, or, we borrow in an emergency. Hopefully you have a rich uncle, if not, you’ll “borrow” from your credit card. This is where the rainy day fund comes in: as your allocating your income to cover your expenses it is a really good idea to ear mark some of that income toward a rainy day fund. At first, just try to save up $1,000, this will help you absorb many unexpected expenses. Once you reach that milestone, you can get more ambitious and try to save up three or even six months of your salary. Allocating that extra money to the rainy day fund might force you tighten your belt a little more. But it’s like insurance, you don’t need it until you really, really need it. In this case, it can make the difference between slipping into unwanted debt versus just being able to roll with the punches. We often see “zero-based budgeting” and “envelope budgeting” conflated as the same thing. However, technically they are two separate systems, but they go together like PB&J. With an envelope system setup with a zero-based strategy, you’ve prioritized how you will spend your money and you’re able to move money between envelopes if needed. Here’s a sample of the flexibility you get with envelope budgeting . Say you’ve budgeted $600 for the month for groceries, and the last two months you’ve been killing that budget, spending only $500. So before your next paycheck comes along, you have $200 already in the grocery envelope. When you get paid you have the option to distribute the full budgeted amount ($600), or top off just what’s needed ($400) and put those extra dollars in different envelopes, like a rainy day fund. Or here is another way the example can play out. You are still doing great with keeping under budget for groceries, but let’s imagine you find you overspent on your budget for on demand movies…too many good movies rented last weekend because not everything is on Netflix! With the envelope system, no worries, simply move the extra cash from your groceries envelope, and pay off that deficit from your movie binge. No need to even touch your rainy day fund! Personal finance software makes all of this very easy to set up and manage. By categorizing all of your expenses and income, you’ll quickly see at a glance the envelopes you’ll need to fund in your budget. Banktivity’s envelope budgeting feature allows you to quickly see where you are at any time, and what might be underfunded by the month’s end. No guesswork, no physical envelopes in your sock drawer that you need to shift dollars to and from. You’ll find yourself in total control of every dollar (and subsequently less stressed) at any time during your paycheck cycle when use a zero based budget in an app like Banktivity. Are you ready to give it a try? If you’re needing more resources on the topic, check out our other Personal Finance 101 article on envelope budgeting, and attend our free webinar class Mastering Envelope Budgeting. Within a few months you’ll be seeing the impact. Do you have a zero-based budget? If so we’d love to hear how you’re doing. Budgeting is very important to us, and we have been trying to get IGG to recognize that for years. The shortfall: The inability to set up a budget to reflect month-t0-month differences in living. ie: Property taxes are due in November . . . .not January, February, March . . . Final payment on a big vacation is due in June . . . .not August, September, October. MS Money was able to provide this feature 15-years ago, but for some reason IGG refuses to acknowledge the need. Using a zero-based system with envelopes, what I do is a little bit different. For example my vacation is in late August, and I’m starting a new budget for 2018. Since I am allocating all my paycheck, and vacation is a priority for me, take my vacation target, say $1500 and divide that by 8. This way starting in January right through August, I’ll be building up the money in that envelope so that it’s fully funded when August roles around. A little different but I think we have the same aim. Great informative comment, thanks Bill. I tried this app a while ago and that was a huge issue for me. I thought with the new releases it would have been fixed and was about to give it another go. Thanks for saving me the time. Probably a good idea for some. My problem is I need a budget starting ‘July 1 & ending June 30’. You have ‘Reports’ with customisable dates as required, only sensible to have ‘Budgets’ the same. I’ve been waiting for years for this to make Banktivity perfect. Thanks for you comment. With Banktivity we’ve taken the start where you are approach in terms of set up. We do get requests for manually set budget start dates and I’ve added your request to our feature list for future considerations. You can set the fiscal start date to July 1, then the year view for the budget will show what you want. I’ve tried Banktivity 5 envelope budgeting and found it to be very cumbersome to use. I gave up after a couple of weeks. I’ll look into version 6, but the main requirement for me is ease of use. Hi Shawn, thanks for your feedback. Is there anything specific we could to make budgeting easier to use? We hope you’ll give Banktivity 6 a try and let us know! It would be good in a budget to have the hability to choose dates, from.. to. That’s how I do it too John (is there any other way? )..Banktivity copes very well with this zero based envelope budgeting on desktop but is still falling badly short (for me) in that I cannot see my envelopes on mobile. That’s great to hear Paul. And hopefully some good news for you, we have major upgrades in the works for Banktivity for iPhone and iPad which are bringing envelope budgeting. We’re not close enough for a release date yet, but are working to get there. Thanks for the comment! It is really great to have the variable month budgeting available that zero-based budgeting really requires. There’s still one serious bug with it that I hope you can fix quickly. It causes the reports to calculate the wrong totals. Let’s say that I don’t have anything budgeted for Christmas Presents Expense in July. But then, I’m in the store and I see the perfect gift for my sister, so I spend $50 on it. When I look at the reporting for the budget for the month of July, I see the $50 under the Christmas Presents expense, but it’s NOT included in the total for the month. What I’ve figured out is that Banktivity is only adding up the Actual amounts for those expenses that have a non-zero amount budgeted for the period. Also, the colored bar in the report is blank instead of red. There’s an outstanding bug report about this problem from me, but it hasn’t been corrected yet. I think Bill has a point, and the tips article you referenced covers just half the problem. If I’m taking a vacation next June I need Banktivity to tell me what I should be putting away each month, and adjusting those figures as I get behind or ahead of myself. An integrated Budget and Goal tool would be most welcome, I don’t think I’ve missed it? It’s a pretty big under taking programmatically speaking, but an excellent suggestion. The work around I used (for a zero-based set up) was putting everything I earn and must pay in a month into a spreadsheet with the amount. Then I added my annual must pays like registering my 2 vehicles, kids birthdays etc. Then I added the “would be nice to have” categories in the same manner, monthly and annual. The same process for discretionary spending. Next, for the annual or irregular spending categories, I divided the total by the number of months between now and then, so I have a monthly amount to budget for. With that info it was easy to add my category envelopes in the spreadsheet for each until I hit zero-dollars left. Then I set up the budget envelopes with those same amounts in Banktivity. On my wish list is a more accessible Notes Box for each Envelope. I would then just make a note in that box of (a) the date and amount of each annual bill and (b) my calculations of the monthly set aside needed to reach that total by the time th3 bill is due (simple maths)..
With the recent focus on zero-based budgeting and envelope budgeting I’m seeing in the Banktivity webinars & blog – any plans to add those to the mobile apps? It would be super valuable to see how much you have left in the envelopes when you’re out shopping or otherwise away from your computer. Hi Kenny, yes there is! We’ve been working on upgrades for our iOS Banktivity products for sometime now. No public release date yet, but it will be coming! Thanks for your comment. Excellent news! I assume we’ll hear something about it on the mailing lists when the release date is announced? come from? I see no debits anywhere? Does it come from next months income or what? credit addition; this $1000 might be coming from a credit card overspend or some other borrowing..feats the whole purpose of zero-summed envelope budgeting..what am I missing here? These are great questions. The answer to your first question is your bank account. It might be helpful to visualize that Banktivity envelopes in your budget are like real old school paper envelopes, except with Banktivity, the cash is actually in your checking account, instead being physically placed in the paper envelope. When the budget is set up, if you already have put aside money ear marked for an expense, that is entered as cash on hand in the Banktivity envelope. But most likely many of your envelopes will be empty until your income is deposited, and the cash can be distributed to envelopes that are below target. So for example, lets say I just got paid Friday, and distributed all my cash. Today I grocery shopped and instead of spending my budgeted 300 (big family 🙂 ), it was $375. I get paid biweekly, so when I get paid, I put 2 weeks grocery shopping money ($600) in my groceries envelope, so that I know it is funded. I also have a “rainy day fund” spending envelope I put $70 from every paycheck in (monthly target $140) to make sure I have some cash available for the unexpected. So I have 2 choices here. I could task myself to making up the $75 overspend and spend $225 or less on next weeks groceries, or I could take that $75 from the rainy day envelope. What’s nice about the envelope system, is if you have cash in any envelope you can move it if it’s more important to you to do so. Say I’ve been putting away $10 a month for gardening supplies, and happen to have $110 in the envelope right now, I could choose to move some of that to cover the grocery overage etc. So to your point, the money you keep in your envelopes has to be “real money”. Why zero-based is so powerful, is once you’ve settled on which expense categories matter most to you, and assigned your real income dollars to them, you’ll know right away if you’re spending “outside” of your budget, which would obviously be debt spending. Without that knowledge, we could be tricked into thinking there is extra money to spend, or overspend in a category. Does this help? function if it defeats the whole purpose of zero-summed budgeting? otherwise my CC debt continues to mount and/or savings dwindle..have I got this right? That’s right! One thing to add is, Banktivity will want to fund your envelope to its target, so you can choose to do that with your next income distribution or not. This gives you the decision power on how you plan to deal with the over-spend. If you’re hoping to make the difference by lower spending next week if you can, or you can decide to fill the envelope to target. What we’re trying to point out here is with the envelopes you can make an adjustment from other funded envelopes if it works for your situation, or if not, you can fund the envelope to target, but in the zero-based scenario that would mean not funding an existing envelope, since that money is already accounted for. Ultimately it means no surpises, even if it does take austerity to get back on track. Just to be clear: adjustments are only for when you need to well, adjust, an envelope because something is wrong. For day-to-day use, ALWAYS move money *between* envelopes. Great article, good theory. Unfortunately this is impossible to do in Banktivity 6 because of how it deals with transfers. Some transfers I want to include in my budget (Mortgage total, i.e., what actually debits from my checking, I don’t care about the interest split, transfer to savings for savings goals) and some I want to exclude (paying credit cards, or transferring to another account for a different use, etc). One difficulty this causes is the transfers get included as income in the budget. Another is Banktivity doesn’t seem to automatically assign unspent money for savings or something else, you have to budget it. Finally, it would be really helpful to budget only net income from my paycheck, rather than budgeting disability insurance or Federal tax etc, which are not things in my control. This is pretty much the only part of Banktivity that I simply cannot get to work for me and it seems like you really want this to be the killer part of the application. I still budget in excel at a macro category level, which works so easier for me, but I’d love to do it in the app. 5) Exclude the mortgage account from the budget. And that’s it, you’ll have a scheduled transaction in your budget for the total amount of your mortgage payment. For the other issues, you can exclude certain categories from your budget if you don’t want them in there, like “Federal Tax”. I have a similar problem with the purchase of mutual funds or money market funds. I see removing a brokerage/retirement account from the budget will make a transfer show up as income, and then can have a budgeted amount assigned to it either negative or positive based upon whether it is income or an expense. I think I would prefer to be able to assign a category to the mutual fund purchase so I could budget for monthly or yearly purchases of “Retirement” or “Investment Savings” goals and the reinvestment of capital gains, etc. I do have separate accounts for retirement and investments but in truth the money is transferred to the account and then the purchase is made. Also, sometimes I will sell part of a money market fund and use it to purchase retirement or long term investment funds. I think of the purchase of mutual funds as buying anything else let’s say a car, and when it is sold the money that comes back into the account is assigned as income to that expense; hopefully more than the original purchase in the case of investments. Thanks for responding to these comments. I do enjoy using your software and learning more how to fine tune it to use it more effectively. Jon – You cannot add a transfer payment to your budget. I’ve tried many times and it simply doesn’t show. I’ve added my mortgage as a bill and as an expense. I’ve put in the net amount and showed it as a transfer to the right account, and as soon as you click ‘done with this expense’ it simply doesn’t show up anywhere. It’s not in the bill list or the expense list and doesn’t show in the mortgage. I think the reason why is that it’s not in the category list when you select categories to include or not include. Perhaps I am doing something wrong, but I have never been able to get this to work and excluding my mortgage, car payment and savings goals (all transfers) from my budget makes it a bit pointless. I am surprised this does not have a year to date view. I have been asking about that on your regular reports too. That is the view that many times is the most important. For example, to be able to compare car expenses budgeted vs. actual year to date. I might not have estimated accurately what months my car will need repairs, but I am curious as to what percentage of that budget has been used up to date. Hi Ian – I have tried this but there are definitely issues and some of them seems like genuine bugs. If I try and budget anything that’s a transfer (such as to another account) Banktivity will say it’s categorized as income, even if it’s DEBITING the account I’ve included in the budget and CREDITING the account I excluded from the budget. Example: Checking -> Savings $1000 monthly. Banktivity insists on showing that as income, even though I including Checking account in the budget and not the saving account. Mortgage and Loans which are already set up are included automatically. Budgeted bills also show but the difference between the green diamond and the bar is confusing. 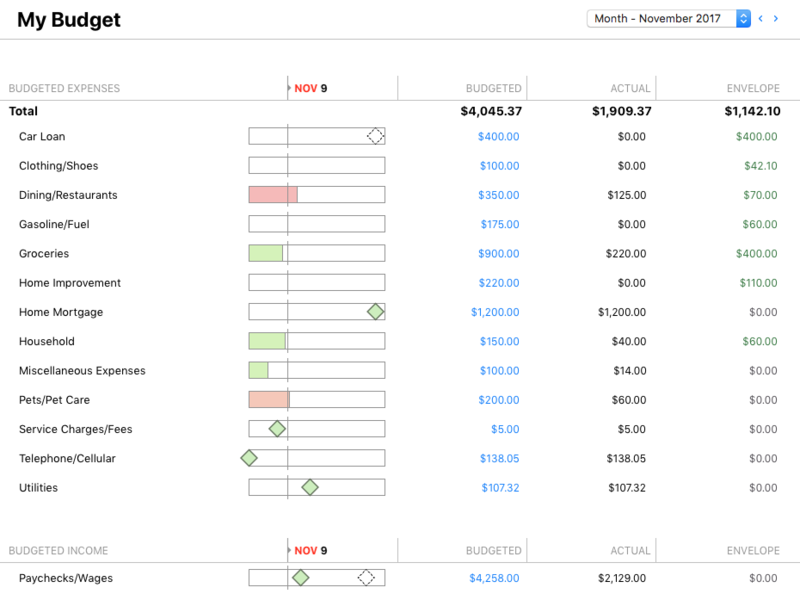 You can go over budget on a scheduled item and it won’t draw your attention to it (at least not that I can see). I would like to migrate from YNAB. 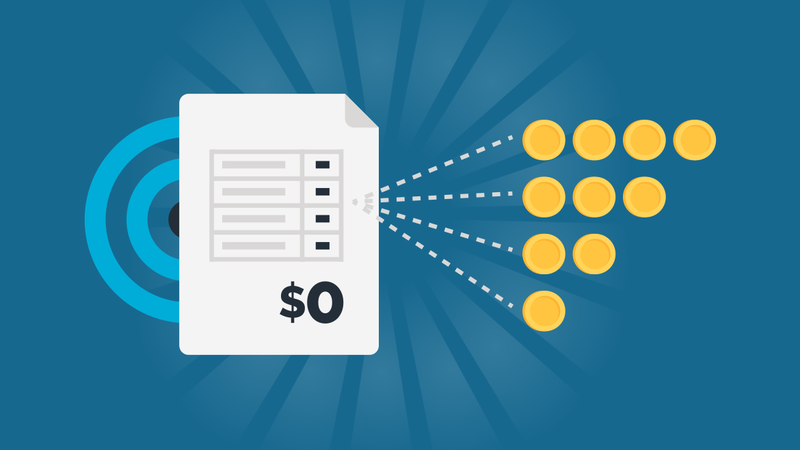 What’s the best practice to migrate my historical budget data to Banktivity? Many thanks! I’m not sure of the export options for YNAB, but I don’t believe you can export your budgeted amounts. It is probably best to just start a new budget from scratch in Banktivity.